Mollusca is the group of animals that includes gastropods (snails, slugs, limpets etc), bivalves (clams, oysters, mussels etc), cephalopods (octopuses, nautiluses, squids etc), scaphopods (tusk shells), caudofoveates, solenogastres, monoplacophorans and polyplacophorans (chitons). It is one of the most diverse groups of animals in terms of body forms and the number of species: it includes the largest invertebrate animals – the giant and colossal squids – to common garden snails and tiny, transparent, shelled sea butterflies. 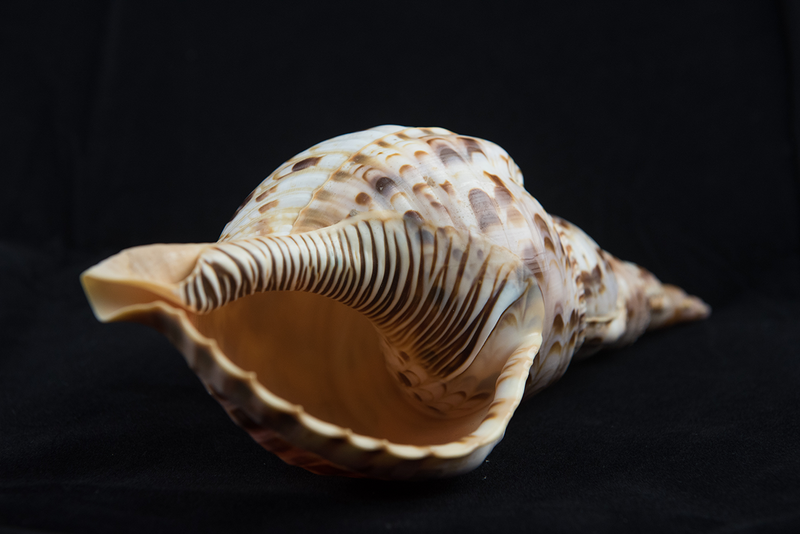 The beautiful shell of a Triton's trumpet (Charonia tritonis). The Museum's collections reflect this diversity: the mollusc collections are the second largest collection by group, with just under 80,000 specimens in the collection. The majority of the mollusc collections are dry specimens: shells, borings and other hard parts. The fluid-preserved collections were mostly acquired for use in teaching, as well as representing some of the soft-bodied forms. Additionally, there are many mollusc specimens in the microscope slide collections at the Museum. These collections have not been organised by animal group yet. The fossil mollusc material is held in the Museum's Palaeontology collections, and a few mollusc collections related to former curators are maintained at the Oxford University Museum of the History of Science. Many of the founding collections of the museums at Oxford University included important shell collections, although few individual specimens can be traced back to the 17th century because the details of large collections donated to the museum were not recorded at the time. Historically, various mollusc collections were kept in separate departments of the museum and were only amalgamated from the 1980s. One of the most important mollusc collections at the Museum is of marine shells collected from Port Alfred by William Turton (1762–1835). The shells are listed and figured in Turton’s publication The marine shells of Port Alfred, S.Africa, and the collection contains several hundred type specimens. There are other type specimens in the fluid-preserved and dry collections. The mollusc collection is comprised of several hundred subcollections: the collections of Sir Walter Trevelyan and Admiral John Harvey are two of the largest, in addition to the material transferred from the Ashmolean Museum and Christ Church in 1860. Smaller collections include those of D Baden-Powell, S D Bairstow, G Barlee, W Burchell, A J Cain, JC and C W Dale, W T Elliott, Eton College Museum, A P Gardiner, L W Grensted, G D Hale, A J Jukes-Brown, E R Lankester, C Napier, F Pascoe, W H Robson and D Whiteley. There are also a few specimens from notable collectors Theodore Cantor, Charles Darwin, Revd F W Hope, G W Smith, J R le B Tomlin, W F R Weldon and J O Westwood. Just over a third of the mollusc collection is currently catalogued and available through Collections Online. The collection continues to expand. Recent acquisitions of note include specimens of the scaly-foot snail (Chrysomallon squamiferum) and a comprehensive collection of terrestrial and freshwater molluscs from Oxfordshire collected by the late Arthur Spriggs.